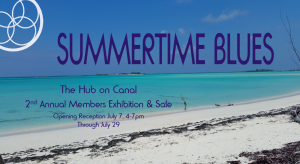 Cure The Summertime Blues with the Members of The Hub on Canal! Summer in New Smyrna Beach is Hot! Hot! Hot! Stay cool with our Hub members and create your own interpretation of this year’s theme- Summertime Blues. Join us as we present the 2nd Annual Hub on Canal Members Exhibition & Sale highlighting works created by The Hub’s members. 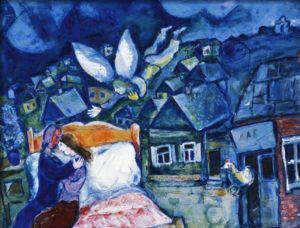 The Summertime Blues exhibit will be on display July 7 – July 29. 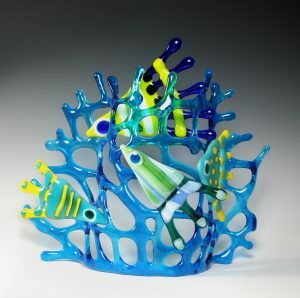 Opening Reception: Saturday, July 7, 4PM to 7PM. Fun prizes to be awarded at 6PM. Entry Fee: $35.00 (Includes 12” X 12” X 1 ½” wood panel or canvas) Two pieces of artwork per artist. One piece for $35, two for $60. Open to: All Hub on Canal members are eligible to participate. All work submitted must be original works, may be in 2D or 3D mediums, and will be priced by the artist. Suggested price is $125. Click here to print and fill out your Entry Form! Payment can be made and canvas or wood panels picked up at The Hub on Canal, 132 Canal Street, New Smyrna Beach. Please complete and submit Entry Form at the time of payment (two if you have two pieces).